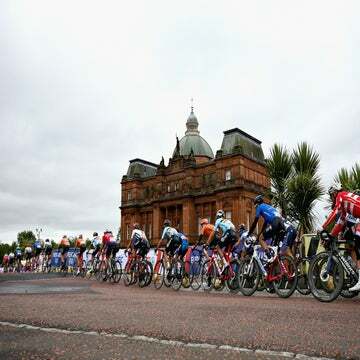 COPENHAGEN (VN) — UCI president Pat McQuaid strongly denied suggestions that family connections played a decisive factor in this week’s successful bid by Richmond, Virginia, to host 2015 world championships. In an exclusive interview with VeloNews, McQuaid said that Richmond won, “on its own merits,” and shot down allegations that the role of his younger brother, Darach McQuaid, who acted as an advisor on Richmond’s bid, had any undue influence on the UCI management committee’s decision Wednesday. “I told my brother from the outset that I did not want him to communicate with me on this topic on any kind of level, and he understood why,” McQuaid told VeloNews. Darach McQuaid’s presence raised eyebrows among some observers, who questioned a perhaps too-cozy relationship between cycling’s governing body and the presence of the UCI’s president’s brother on the team that prepared a bid to host what will be just the second time the U.S. has hosted the world road cycling championships. Darach McQuaid, the youngest brother of the extended McQuaid family, told VeloNews he was hired as a consultant by Richmond government to help the city present its bid to the UCI. Darach McQuaid has a long-running partnership with David Kalman, an event promoter based in Richmond. Together, they run ShadeTree Sports, a Richmond-based sports promotion company, with Kalman based in Virginia and McQuaid in Dublin. About three years ago, Kalman approached Richmond political and business leaders to gauge interest in pulling together a plan to bring the world championships back to U.S. soil. To Kalman, the Richmond area, about 90 miles south of Washington, D.C., seemed an ideal location to host a world championship. The region’s low hills provide an excellent mix of terrain to create a world-class course. Richmond also offers plenty of infrastructure and hotels to handle the world championships entourage, and is within a day’s drive of some of the East Coast’s largest metropolitan areas. When government officials, including Mayor Dwight C. Jones, and local business leaders expressed interest, Tim Miller, a principal at Shadetree Sports, left Shadetree; in May, Miller and Lee Kallman (no relation to David Kalman) created the non-profit group Richmond 2015 Inc., to manage the world’s bid. The Richmond 2015 organization was founded not only to expand fundraising abilities for worlds, but also to avoid any public perception of a conflict of interest with the UCI. “This is an effort that’s supported by so many different players across Richmond, with support from the government, the business community, the fans,” McQuaid said. As the bid gained steam and became a serious candidate to host the event in one of the five-year windows that the worlds reach beyond Europe, the UCI president said he purposely reduced contact with his younger brother in order to avoid appearances of a conflict of interest. Plant, the president of USA Cycling from 1995 to 2002, is the founder of Medalist Sports. Though he is now a vice president with the Atlanta Braves, he remains closely involved in cycling. A member of the UCI management committee, Plant was instrumental in meetings between former UCI president Hein Verbruggen and billionaire entrepreneur Phil Anschutz to develop the Amgen Tour of California. Medalist Sports, now owned by Jim Birrell and Chris Aronhalt, has managed operations at the Amgen Tour of California, the USA Pro Cycling Challenge, the Tour de Georgia and Tour of Missouri. Darach McQuaid isn’t the only member of the Irish family with strong ties to cycling that sometimes creates awkward moments for the UCI president. McQuaid’s two sons, David and Andrew, both work within the sport, with David organizing such events as the Tour of Mumbai in India, while Andrew works as a riders’ agent. For years insinuations have lingered that the McQuaid family has its fingers in too many pies within professional cycling. The McQuaid sons are both former racers who have decided to continue their careers within cycling, but privately told their father they would quit their activities within the sport if it made things too uncomfortable. Pat McQuaid, however, strongly defended his sons’ rights to make a living in the sport he says they both love. “I come from a big cycling family. We’ve all grown up racing our bikes. My son’s a lawyer. He has a right to look after the legal rights of riders, and he’s a lawyer who understands cycling. It started with his friends, Nicholas Roche, Daniel Martin, guys he raced with since the junior level. They asked him to look at their contracts. Then word of mouth spread and now he looks after other riders, too. It has nothing to do with me,” McQuaid said. McQuaid said interest remains high internationally to host world championship events despite the fact that Ponferrada, Spain, for 2014 and Richmond for 2015 were the only bid cities that were under consideration during this week’s UCI meetings. “We have no shortage of candidates. Just in the past few days, I’ve had three different places expressing interest in hosting a world championship,” he said. Velo magazine editor in chief Neal Rogers and reporter Brian Holcombe contributed to this report.